Although I think it’s necessary to develop fusion reactors there is less and less support in doing so and I’m not so sure that the global decline in forest area can be stopped. I’m pretty sure I’s possible to enhance efficiencies on all levels but I’m not so sure it’s wise to subsidize the current renewable technologies until the time these technologies become competitive with fossil fuels. Wouldn’t such a strategy consume to much subsidy monies? Did you happen to read the book “Burn Out” (2017) written by Dieter Helm? He is convinced that the low fossil price is a direct consequence of the lower energy intensive growth in China combined with a gas surplus communing from fracking in the states combined with renewables with nearly zero marginal cost that undermine the spot wholesale markets. He is also very optimistic that the climate change will get solved if we encourage entrepreneurs in developing new technologies. I’m very interested to hear your view on this technological development approach. By the time that I got around to his email, my fall semester was over and I found myself with some available extra time. I promised him I would read Dieter Helm’s book, Burn Out: The End Game of Fossil Fuels (Yale University Press, 2017) and get in touch with him as soon as I finished. Now that I have, I’m sharing my thoughts. Professor Dieter Helm is an economist specializing in utilities, infrastructure, regulation and the environment, and concentrating on the energy, water, communications and transport sectors primarily in Britain and Europe. He is a Professor at the University of Oxford and Fellow of New College, Oxford. In December 2015, Dieter was reappointed as Independent Chair of the Natural Capital Committee. Dieter’s recent books include: Burn Out: The Endgame for Fossil Fuels, The Carbon crunch: Revised and Updated and Natural Capital: Valuing the Planet. These books were published by Yale University Press. Nature in the Balance, edited with Cameron Hepburn, was published in early 2014 by Oxford University Press. Links below to other titles. During 2011, Dieter assisted the European Commission in preparing the Energy Roadmap 2050, serving both as a special advisor to the European Commissioner for Energy and as Chairman of the Ad Hoc Advisory Group on the Roadmap. He also assisted the Polish government in their presidency of the European Union Council. When you read this, the oil price could be anywhere between$20 and $100 a barrel. It could even be outside these boundaries. Although it will matter a lot to the companies, traders and consumers, it will not tell you very much about the price in the medium-to-longer term. The fact that the price was $147 in 2008 and $27 in early 2016 just tells you that it is volatile. He is absolutely right. 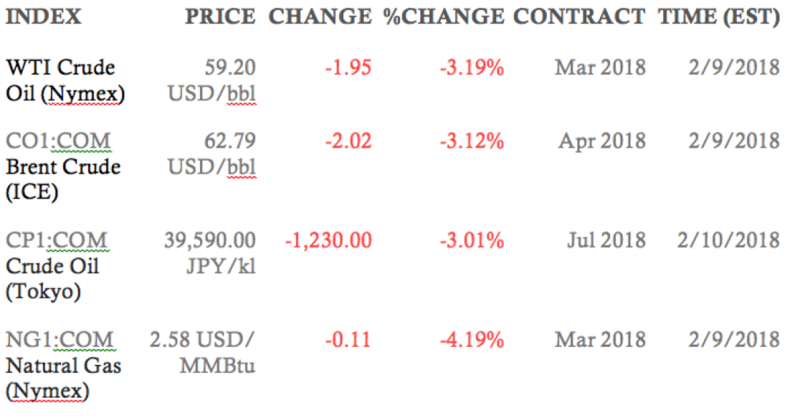 I’m including recent oil and natural gas prices as taken from Bloomberg below. JPY is Japanese Yen. Bbl, kl, and MMBtu are all measurement units. Bbl stands for barrel: one barrel equals 42 US gallons or 35 UK (imperial) gallons. One barrel of crude oil equals 5604 cubic-feet of natural gas. One US bbl= 6.2898 kiloliters (kl). One MMBtu is equal to 1 million BTU (British Thermal Units). One standard cubic foot of natural gas yields ≈ 1030 BTU. I am not going to get into the book’s conclusions and analyses but I think that my friend’s brother was a bit premature in giving up on fusion and subsidies for sustainable energy sources. We just need to make sure that at the same time, we keep subsidizing the fossil fuel industries and allowing them to amortize – pay off – their oil reserves. As supporting evidence of this shift, he cites the declining profits of current oil producers in the Middle East, Venezuela, Russia, etc. – with the noticeable exception of the United States. The year of publication of the book is listed as 2017 but he doesn’t mention President Trump or his contributions to the energy transitions that we are experiencing. I assume that this means the book was written before the 2016 election and published early last year. My overall perspective is that the author is writing this as a Big Oil man predicting the downfall of the oil industry. But it is conspicuously lacking any mention of the industry’s intensive efforts to prevent/delay its collapse by helping to finance climate change deniers. I am in full agreement with the author’s conclusion that with the advances in fracking and horizontal drilling, peak oil doesn’t exist anymore. I also think he is right that the global economy is shifting to other forms of producing electricity. One of the first things that I teach my students is that electricity is not a primary energy source – it is a product. Even when we shift to electric power (e.g. electric cars), it is critical that we are aware of the primary energy sources (e.g. solar, wind, natural gas, etc.) that give us that power. My practical conclusion from reading the book is that I want to use this blog as a platform – at least twice a year – to analyze our progress in the energy transition. I will start this process in next week’s blog. This entry was posted in administration, Anthropocene, Climate Change, Sustainability, Trump and tagged Adaptation, amortize, Anthropocene, Anthropogenic, bbl, btu, Clean Energy, Climate Change, Climate Change Denial, Climate Change Deniers, Climate Skeptics, CO2 emissions, crude oil, Dieter Helm, Donald Trump, electric car, Electricity, Emissions, Energy, energy source, energy transition, Environment, fossil fuel, Fossil Fuels, fracking, fusion, gas reserve, Global Warming, greenhouse gas, horizontal drilling, kl, Mitigation, mmbtu, oil reserve, peak oil, Physics, Power, Power Plants, Science, Solar Energy, subsidy, Sustainability, Technology, Trump, Yale. Bookmark the permalink.